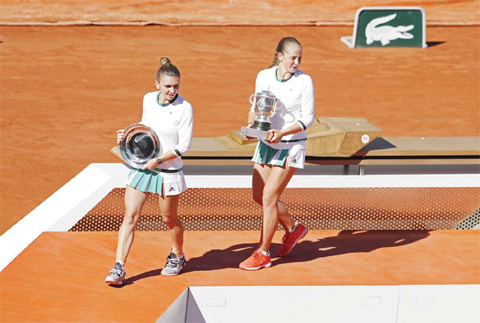 For Halep, bidding to join compatriots Ilie Nastase and Virginia Ruzici as major winners, it was a second final defeat in four years at Roland Garros. The 25-year-old would have replaced Angelique Kerber as world number one with victory, but Halep was overpowered as Ostapenko blasted 54 winners to the Romanian’s 10. “I am sick in the stomach with emotions but hopefully I can win this one in the future,” said Halep. “I want to congratulate Jelena. All the credit for what you have done. Enjoy it, be happy and keep it going because you’re like a kid.” Ostapenko set the tone immediately on a raucous Court Philippe Chatrier, disguising any nerves with an array of bruising groundstrokes to break Halep in the opening game. But the Romanian delivered a swift counter-punch, hitting back straight away on the Latvian’s serve before holding with ease for 2-1. More crisp striking from Ostapenko nudged the 20- year-old ahead once more, but the errors flew off her racquet just as regularly and Halep pulled 4-3 in front. Ostapenko’s wildness betrayed her as she served to stay in the set at 4-5, netting a forehand to offer Halep set point and drilling long to gift the Romanian the set. The Latvian’s mood soured further when Halep escaped from 0-40 down to begin the second set, the third seed then breaking Ostapenko to compound her frustration. Halep consolidated with a gritty hold for 3- 0 before Ostapenko fought off a trio of break points to stall her rival’s momentum and spark an incredible comeback.